I had an incredible weekend. No, I didn’t break my half-marathon PR and I wasn’t the first (or probably last again) on my age group, but I finished another half-marathon yesterday. Remember when I post here about my next crazy adventure? Well, by completing that race I finished the challenge! 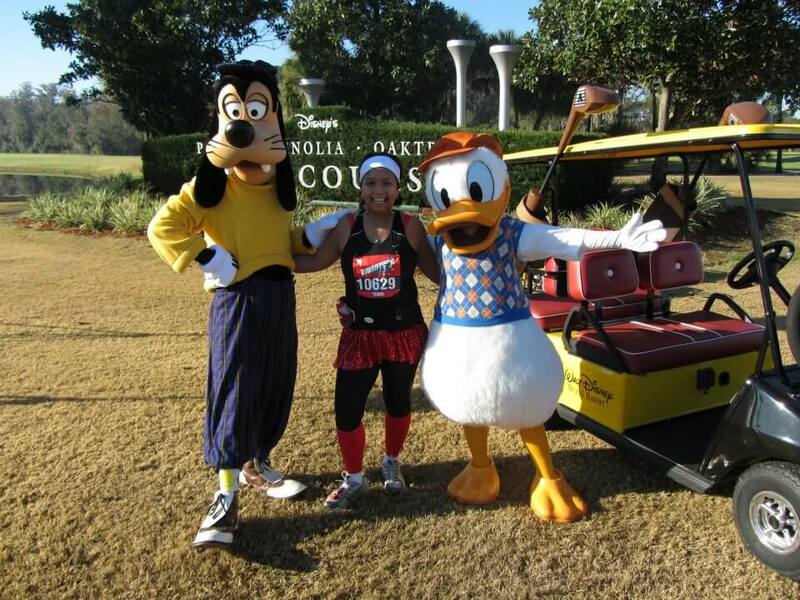 I did Disney Coast-To-Coast challenge and January is not even over! Thank you VERY, VERY much for everyone who donated and support my cause. There were total 369 runners from Team in Training for this race and collectively, we raised ONE MILLIONS DOLLAR! ZOMG. That’s a lot of dolla. I was very impressed and touched. This money can do so much for further research and patient support and I can testify and attest to that from the personal experience! I have a stack of thank you card that I need to send out for all my generous donor who supported and helped me during my 2011 fundraising season for THREE different event. Everybody was so generous and they were continuously support me on various event! Thank you from the bottom of my heart! I was on the slideshow! The pasta dinner was great. It was a wee bit crowded and there’s a bit of mishap about seating arrangement, but it got fix right away. Food were good and I had wonderful company. They put all the ‘In Honor’ and ‘In Memoriam’ pictures on the slide and it feels really weird to see my own picture up there! We wrapped up the dinner by 8pm and I went back to the room and get my things ready for the race. My husband woke me up at 3am (YES, THREE AM) to get ready. I was not a happy camper. After I whined about 10 minutes, I finally got up and got myself ready. I ate my usual pre-race breakfast, english muffin + peanut butter + honey + banana and head downstairs to meet the rest of Team in Training runner. We hung out for a bit, took pictures and started to walk to our corral at 4:30am. 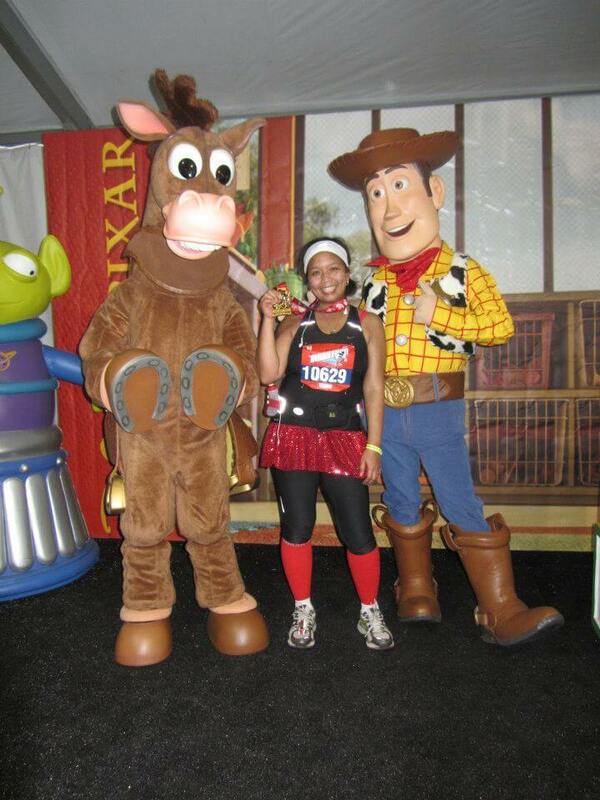 Unlike WDW Marathon, my husband able to walk me all the way to my corral and stood there with me while I was waiting for our corral turn to start. It was a good 40 degrees morning, calm and a bit chilly. I felt surprising calm and not anxious. First wave of runner and the wheelchair went out promptly at 5:45am and my corral started at 6:05am. 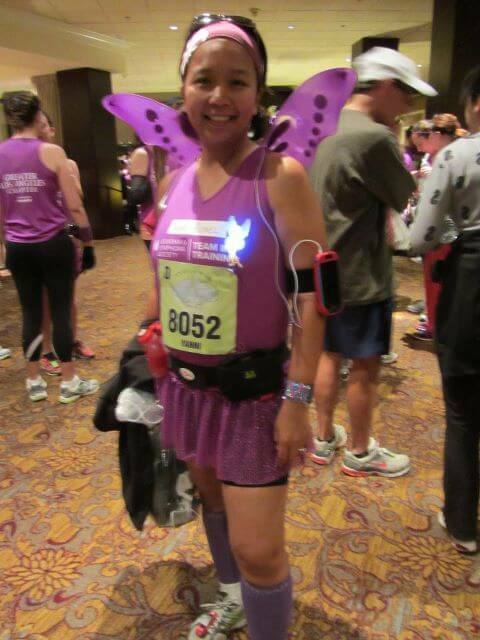 There were so many people with running skirt and wings! It was very, very cool! The first couple miles, I can’t barely pass anybody as there were so many people and I took my time and tried to make my way to the side so I can get a good pace going. We made our way towards Disneyland park from the employee entrance where you can see the train, parade car, and other behind the scenes stuff. It was a lot of fun! That path took us to the side of Main Street USA inside Disneyland Park and we ran towards the Sleeping Beauty castle. It was absolutely stunning. The sun just rise and it made the castle sparkle! I didn’t take a lot of pictures this time around as there were a long lines on each of Disney Character for runner who wanted to take pictures. 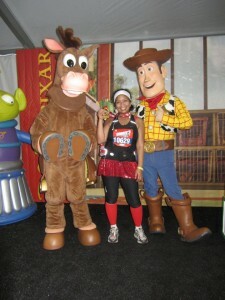 Pretty much all the princesses and their prince were out, I saw Jack Sparow, Mickey and friends, Toy Story character. It was so much fun! I had to made a potty break inside the park and unfortunately, every bathroom had a very, very long lines. I stood there and went anyway but that took about 5 minutes out of my time. 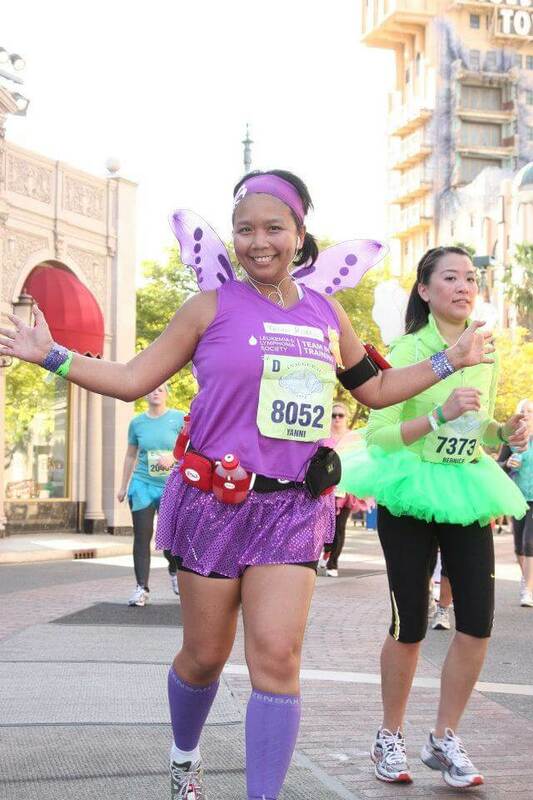 From Disneyland park, we ran towards the center of city of Anaheim. There were so many volunteer and entertainment around! I saw my husband, who wore a tutu (yes, in spirit of TinkerBell) and carry a cow-bell and a sign. It was sooo good to see him! Then I saw Karen Lopez (t) and Rob Farley (t) at mile 5 who also had a sign with my name on it. Karen and Rob F. took an extra day from their busy days to stay at Anaheim so they can cheer me. These two awesome people were on their way home to Toronto, CA and Adelaide, AU from spending a week in Seattle for training/meeting but they bought extra ticket to LAX and spend extra day for me. They are my #SQLFamily. I met both of them via SQL Community and I mentioned this on previous post about how awesome this community is. I’m very blessed and honor to be able to call them a friend. We ran through the city and I saw Karen and Rob. F again between Mile 8 and 9. I had a cheek-to-cheek smile and I felt great! Shortly before we entered California Adventure Park, I felt a sharp pain on my ankle. I had one of those uh-oh moment again as the pain was significant. 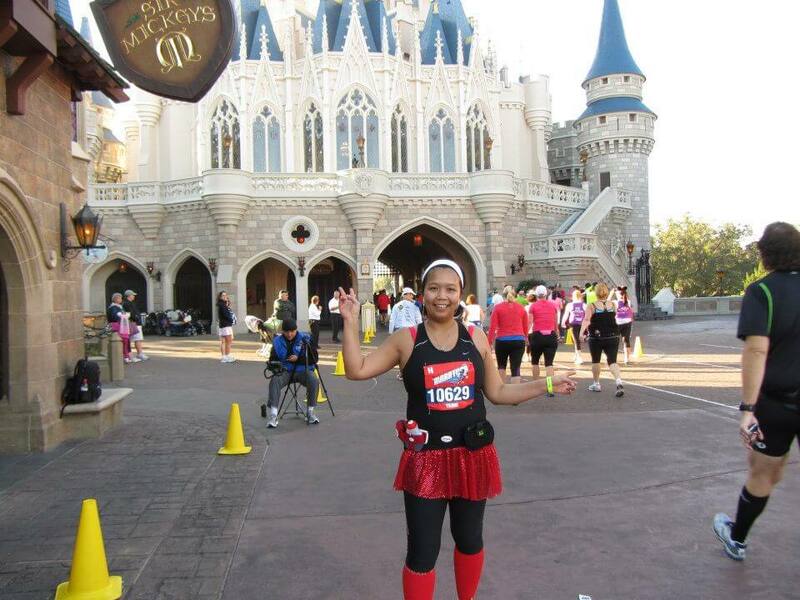 For those who don’t know, I sprained my ankle 10 days before my full marathon, then ran the full, then I spent two weeks walked around the park at Disneyworld. So this ankle took a lot of beating lately! I stopped running, stretched and massage the tendon a bit. I knew I had about 5k to go and I wasn’t going to quit it. 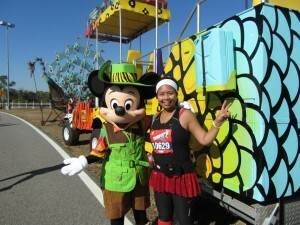 I stopped at the medical tent, took some Tylenol and slowly jog my way towards California Adventure Park. I enjoyed my time running through the park and tried to forgot the pain in my ankle. The cheer-tweets from my #SQLFamily were constant throughout the whole 13.1 miles. I felt SO much love!! I finished! Upright and Smiling! We ran through the park and out and I knew that the finish line was around the corner. I barely could hear my music as the tweets came constantly over my iPhone. I started to run faster and I saw my husband WITH HIS TUTU on top of the bleacher. I waved to him with a big smile. I saw Karen and Rob F. again by the finish line and I lifted my hand up, had the most cheesy smile and cross the finish line. I did it. I finished. I got my space blanket, my medal, and went to Coast-To-Coast tent and got ANOTHER MEDAL for completing the challenge. We then proceed to post-race refreshment where I drank entire powerade in one shot, ate banana and took my official post race picture. I saw my husband from the distance and leap into his arm. I did it!! He gave me a very proud look!! I was about to die of excitement. That’s JEFF GALLOWAY! 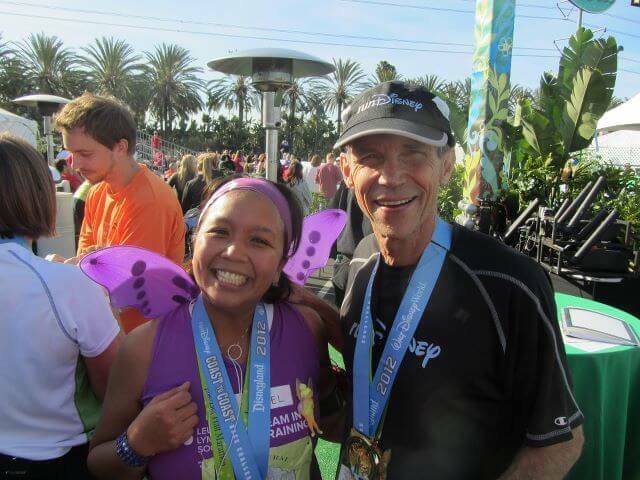 He is the running guru, the Olympian, the mastermind behind the run/walk method, the official Disney Coach and he was TALKING TO ME! You think that would be the highlight of my day, right? I finished, got my medal, got another medal, and saw the awesome video. Well, I thought so too, until I walked into the Platinum VIP area where my husband, Karen and Rob F. was when they cheered me on and I saw Jeff Galloway there. I shook his hand, gave him a hugged and we chatted for a while. I mumbled almost the entire time because I was just a way too excited!! Me and Jeff Galloway. Can you tell I was excited? I am very blessed. This professional community that I belong to become a second family to me. They are there not only when I wasn’t sure what causing the ruckus on my server, but when I need a support for my challenges and adventure. From the bottom of my heart. Thank you. Wow. I’m still in an awe. I’m a marathoner. 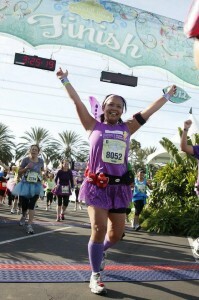 I ran 26.2 miles. Well, I hobbled around the course with a sprained ankle. I ran, I walked. I ran and walked. For a long time. Very long time. But I finished. I was upright, smiling cheek-to-cheek, and wasn’t the last one! It was awesome. It was victorious. It was absolutely fantastic. 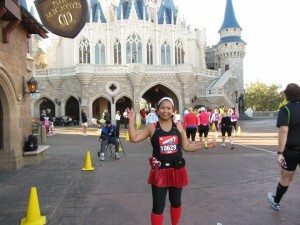 I am a marathoner. The hotel wake-up call service woke me up at 2:30am. It took me another 30 minutes before I actually moved from the bed and started to get ready. I decided to wear my capri as supposed of my short, compression sleeves and a tank. It was a cool morning, about 40 degrees out. I had my throw-away jacket with me as well. About 4:00am – I was sitting on the bus and head out to Epcot. The event started on time. Wheelchair racers were out exactly at 5:30am and before long, my corral started to move to the starting line. Exactly at 6:05am, they let our corral go. I ditched my jacket before even hit mile-1. I was pretty warm. The first 3 miles went by pretty fast. We went towards the Epcot, around and went towards the future world-case and head out from the side, made a loop towards our corral. I felt great. Then I saw John at Mile 4.5!! I was soooo excited!! I blew him kisses and kept on running. I stopped for at porta-potty at Mile 5, did my thing and kept going. We were running on the road that connect Epcot and Magic Kingdom, and I had to tell you – they put some interesting stuff for us out there. 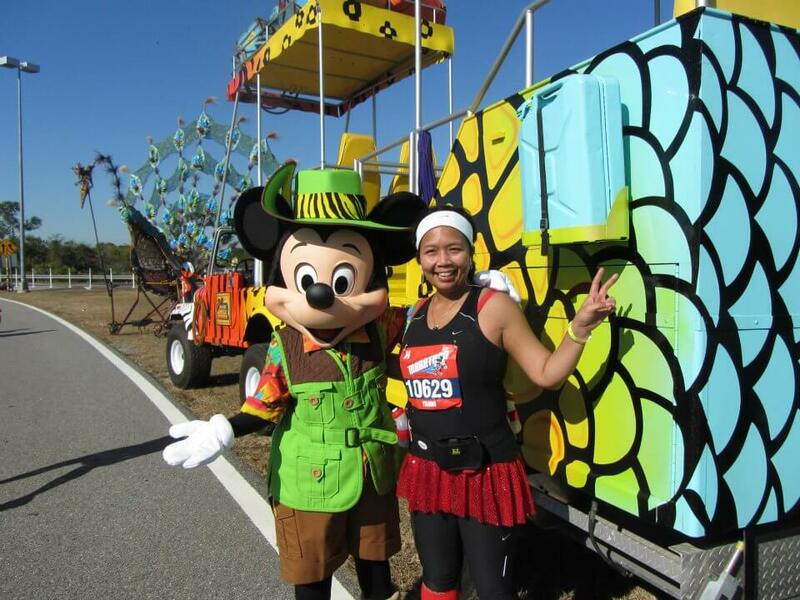 There’s always sign about Disney-fact on the side of the road for you to read as you run (Do you know it takes 7 marathon length to go around all four Disney parks?) and there were Disney characters! I had my camera with me and able to snap pictures with a few of them. We came to Magic Kingdom from their staff entrance and put us directly on Main Street. When I made that turn to Main Street and saw the Cinderella Castle, I had to admit, that was very, very cool. I saw that castle the day before so it’s not like that’s the first time I saw it, but I had the same reaction with my daughter the day before. It was one of those “awwwww, it’s the castle” reaction. We went around the castle and under it, and out we were to the next park. I was feeling great. I paced myself well, about 2 minutes slower than my normal race pace due to my sprained ankle, tried to be cautious on how my gait and made sure that I did heel-toe inward on my stride. Mile 12 came around, I suddenly felt a pull on my ankle. I had those ‘uh-oh’ moment for a second. I stopped. I stretched it a bit and massage the tendon towards my knee. My physical therapist warned me about this, so did my trainer. I stopped for almost 10 minutes and decided to kept on running, even with slower pace. I hit the half-marathon mark and the sun was baking me! It was pretty warm! The stretch between Magic Kingdom and Animal Kingdom had a couple overpass, which mean, a hill. I was doing okay though, even though I can feel my ankle somewhat throbbing. No, shooting pain though so I kept going. There so many tweets that came in between the 13-18 miles. I think it some point, between 15-16, that’s all I hear. It was awesome. I was laughing. I was smiling. I was giggling! Then I hit mile 22. Something changed. My ankle hurt more and more and I started to doubt myself. I never run more than 22 miles before. Ever. It was really a mind game. I had even more cheer-tweets. They were encouraging tweets. I stopped for a minute, tried to massage the tendon around the ankle again and kept running. I had so many people believe in me and I need to switch my mind set. I grabbed a couple Tylenol from the medical tent, and started to run again. The last 4 miles felt very, very long. In fact, my runmeter app was 2 miles off as it already announced that I hit 26 miles when I ran past 24 miles sign! Talk about discouraging tweet! I started to get mad. I want it to be done. We entered Hollywood Studio, and I ran past the entire Disney character there without taking any photo. I could careless about it anymore. I just want to be done! We ran through the boardwalk and headed towards Epcot and when I saw the Epcot famous ball from across the lake, I felt relieved. All I had to do just ran around the lake and head out, then the finish line would be there. Um. Yeah. Turn out, when you just ran 24 miles, those lake at Epcot is HUGE. I kept hearing a tweets and I had to say, that’s what kept me going. My ankle hurt every time my left foot hit the ground and my gait were completely off. People were cheering. There were so many volunteer, Disney staff and just some random people that happened to be in the park cheering us. I can see the Epcot famous ball closer and closer. I took a deep breath and started to increase my pace. Who would’ve though .2 miles could feel like 2 miles? OMG. My phone constantly read the tweets. Everybody excited. Heck, I was excited AND impatience. Who moved the darn finish line??? Then I turn in the corner, and I saw the finish line. 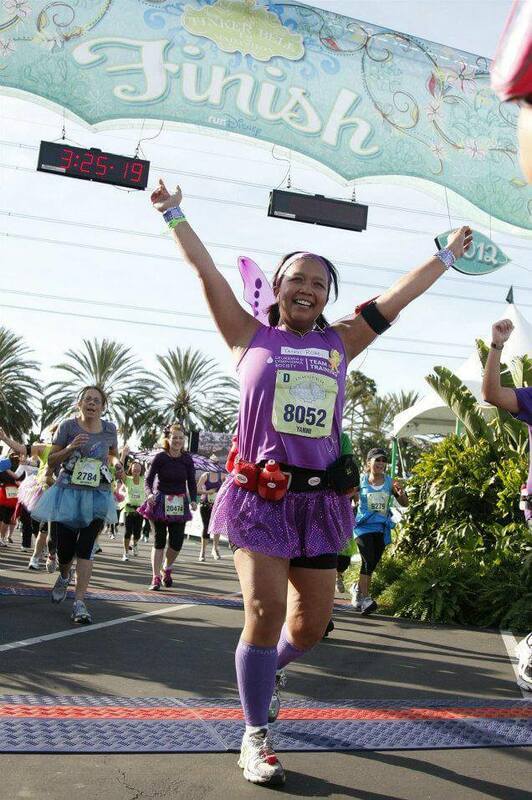 I almost sprint to it, but I remember that my husband and my girls were waiting for me at the left side of the finish line, so I started to look for them. Before long, I spotted them. I saw him waved and grin. I saw my girls with their ‘I love you mama‘ sign, I saw my brother-in-law. My eyes started to tear up and I had the cheesiest cheek-to-cheek grin. I lifted both of my hand and cross that finish line. When the volunteer put that medal around my neck, I started to cry. There was another runner who cross the finish line shortly after me broke down as well, and we ended up hug each other and cry on each other’s shoulder. I didn’t really catch her name other than she wore Team In Training jersey. I grabbed the gatorade, banana and some bagel and head out to the photo line, did my finisher photo and walked back to race retreat tent to meet the rest of my family. I had the same medal around my neck with the elite runner who finish first. That’s the awesome thing about this competition. Every finisher have the same medal. We compete against ourselves, and on that race, I won. I have a long list of thank you for those who supported me during this journey, first and foremost, I want to thank my husband, John. I know this is a public blog and yes, I have said these words in person, but I want to make an effort to say this again here. Thank you, John — for everything you do. From waking up at the wee hours over the weekend, made sure I had my pre-run breakfast and ride your bike alongside me during every single one of my long run for hours to end to everything you did on the race day. YOU are my hero and my inspiration. I love you more than I can say with words. To the rest of you — my family, my best friends, my SQL Family. There were too many names to mentioned, but you know who you are. Thank you for your constant support. For those encouraging words, for the giggles, and most importantly, for believe in me that I can actually do this. You guys are an awesome bunch. 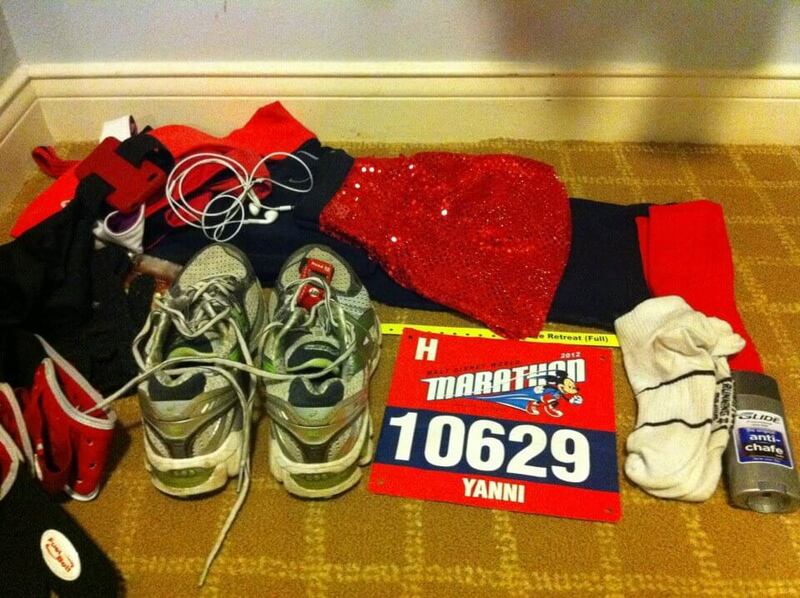 In about 9 hours from now, I’m going to cross the start line for my very first full marathon. That day finally here. 4 plus month of training, three hundred plus miles, a few injuries, challenges after challenges, I am finally here. It’s been absolutely awesome journey and whatever happen tomorrow, I know I am going to give it my best, and more. I will have my phone with me (no, please do not call me as I will ignore you) and I have this cool app called runmeter installed. This app allowed me to find out my pace, how many miles I’ve been running and my time. It also allowed you to talk to me. Yes, this app will read your tweet or facebook message to me. If you are familiar with twitter, you will see the tweet from me that indicate the start of my running. From that moment on, if you tweet me, the app will read those to me (someone please tweet me with different language other than English, I’m so curious on how that sound!). It’s super cool. If you are a facebook person, the same app will post the message on my facebook wall that indicate the start of my run. Please do comment under that post, as I will hear your comment. Say something funny. Something encouraging. Do a tongue-twister words. Spell things backward. Tell me that you believe in me, that I can really do this as there will be moment that I’m going to second-guess myself, especially after 18 miles (or right now as I write this). Thank you for walking (or running) beside me throughout this journey. It’s been awesome. YOU are awesome. See you tomorrow on the other side of the finish line. Anyway, I’m going to just list those here. Both. Things I did, and I didn’t do and hope that I can be better this year. Better on things I did, and actually accomplish things that I didn’t. Back in March when my health were improved, I made a vow to be more active, physically. I started to hike more, and more and visit the gym more. I gained more energy and actually able to chase my kiddos around. I think I accomplished a lot on this front. Note to self for this year is to be more active with my kiddos. I want to engage them on different sports and the freedom for them to try variety of them. As a result of being active, I dropped 28lbs pound. Yes people, I actually weigh 28lbs heavier last year. There. I said it out loud. Note to self for this year is to maintain them, which I believe is as hard as losing them. I love the mountain. I absolutely love it. I love to be in the mountain. Mt. Rainier hold a special place in my heart, not only because it absolutely gorgeous, but because I stood on it’s summit on August 2005. Since then, I have many challenges in my life, health related and I always want to go back. I tried, and gave it all, and more but I didn’t make it to the summit. Note to self for this year is to try it again. It’s the journey to get there that completely awesome. Well, to be able to stand on its summit again won’t hurt either. While are at on the fitness theme, one of the thing that I accomplished last year is also have a healthy lifestyle. That included the choice of food that I eat. Late night donut binge is no longer in the agenda (occasionally cupcakes are okay). I didn’t feel we accomplished a lot as we still ate out quite a bit, so note to self for this year is to cook more at home (Yes, I’m talking to you, John) I am at fault on this more than anything because well, it took an effort to actually do this. I can come up with ‘I’m tired after all day of work and climb/marathon training’ excuse but I’m not the only working mother out there. So let just say, I’m going to be better this year. There are a few charities that have a special place in my heart and this year I did four different fundraising for them. I was shameless and persistent and never hesitate to educate others about the organization that I believed in. Some of my friends have no ideas on things they do. I think I did an awesome job this year. 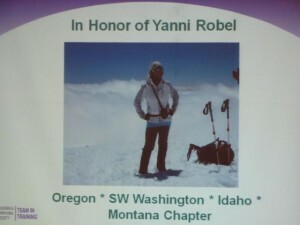 Total I raised on four different fundraising event were over $20,000.00 which was unbelievable. I am surrounded by very, very generous friends and colleagues. I even inspired others to start their first own fundraising for the charities they believe it and they did absolutely awesome! Last year, I attended SQL Skills Immersion Performance Tuning Class, SQL Cruise Alaska, SQL Saturday Vancouver, SQL Saturday Olympia, SQL Saturday Chicago, SQL Saturday Portland and SQL PASS. This list actually surpassed my expectation for technical conferences and training for a year. I learned tremendously, made absolutely valuable professional contact, fabulous friends and really hit a jackpot with the combination of all. This year, I want to even do more. I don’t have a list yet, but I have a few SQL Saturday in mind on top of SQL PASS and another Immersion training. Yeah. Totally failed on this one. Other than being on the panel for WIT Luncheon at SQL PASS, which I was still in awe that I was asked to sit on that panel next to others that I respect so much, I did not submit any abstract to any event. A complete blow on this one. I’m not so happy with myself on this end, but am making an effort, a lot effort to actually do it this year, not just talk about it. Watch me community, I’ll be speaking (somewhere) this year. There. I open my big mouth again, now you can hold me accountable on this. I always considered myself to be a good teacher. I have patience (yes, yes I know – some of you probably raised your eyebrow) when I shared my knowledge. Early last year, I was asked to be a mentor to a group of young women in Indonesia. I did a few talk with them remotely and they have full access to me for questions about technology, career, IT, etc. It took me a while to made them comfortable to talk to me but I am proud to say that these young smart women are no longer in the dark when it comes to technology industry. They have the awareness on what they can do and live up to their potential. The hope is they will have enough confidence to go after their dream. Note to self about this topic, I want to do the same locally here. I have a few career day talk (almost) scheduled for this year at my neighborhood school district. Just as Kendra Little (t) said during one of the WIT talk — We need smart people in this industry. And women is as smart as men, and there are absolutely no reason why they shouldn’t be crowding the technology field. I failed. I did not read 12 books in 2011. Let alone review them. I did read 5 though but didn’t even write a review. Note to self for this year is to actually write the review for the books I read and make an effort to read one book a month. Work-Life balance is absolutely important to me. I am fortunate that my employer is very supportive with it and believe of the work-life balance. I’m proud to say that I did not miss any of my kiddos play/performance last year and able to attend every one of their school events. Note to self this year is to maintain that and to volunteer on their school to help out with an event. Just one. One event for a year shouldn’t be that hard, right? I hate to even say it that I did not build any Lego set last year. Yes. 365 days and not one set build. I owned a lot of Lego Set. Too many to count and some of them are still sealed and never open. I absolutely love Lego and want to actually open those boxes and build something this year. I’m not going to list my work goals here, but I can proudly said that I met every single one of them, and more. Note to self this year is to challenge myself more at work. To think more outside the box and do everything that I can to ensure my team member will get what they need to be successful. I want to be one of those ‘I wish my manager is like that’ kind of person. There. I could go on and on, but I think that’s a good list. Here’s to a great start of 2012 and hope for a continuous success. My Name is Yanni. I’m a Runner. I’m still in an awe. 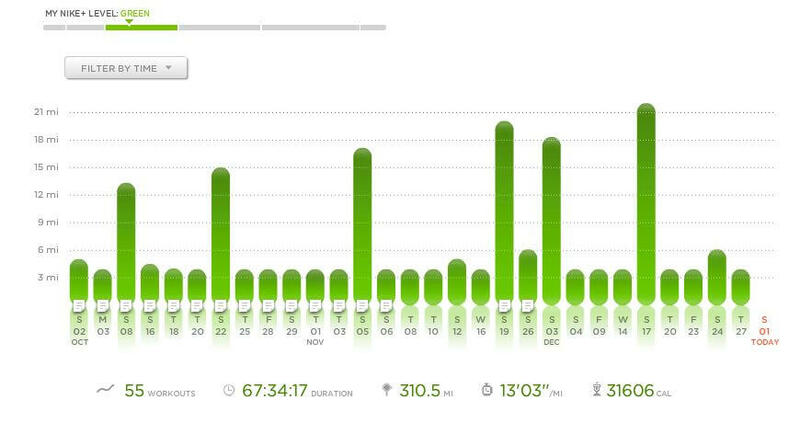 I ran THREE HUNDRED TEN miles on 2011. That’s a lot of miles, considered I started to run on August 2, 2011. I did 55 runs with total 310 Miles. Absolutely awesome. If you told me a year ago, that I would run this much or even run at all, I would laugh and probably said that you crazy. I always said before, I’m a mountaineer. A hiker. I’m NOT a runner and running is not my thing. Well, look at me today. I ran over 300 miles last year and about to take on the full marathon and I can say it without any hesitation now that I *am* a runner. Looking back on all of those runs, reading on each note that I put after each of those runs – it brought me to the moment of each run. The good run, and the bad run. I had many challenges, and some of it, almost made me give up the whole thing but I didn’t. I kept on running. The support from my friends are unbelievable. There were days that I absolutely didn’t feel like being out there and run, but I did it anyway mostly because I really couldn’t come up with any excuse for skipping them. Public accountability, there’s nothing better than that for motivation to run. Cold 30 degrees morning, 5 hours out on the trail with a constant cheer-tweets. I am very blessed. I’m surrounded by awesome people. In my previous post, I talked about my injury. Let me give you an update on that. I saw a foot/ankle specialist the day after the incident. He took one look at the xray, and looked at me, smiled, and said – this is not a fractured. You have a sprained. I almost fell off the chair. WHAT DID YOU MEAN I HAVE NO FRACTURE?? He explained to me in a very simple analogy. The duct tape analogy. If you pulled a duct tape off the wall, and it pull a paint off it, that doesn’t mean the wall is broken. When I twisted my ankle, my tendon pulled 0.03mm of the end of the bone. I have no structural damaged. I have a sprained ankle. Does this mean the race is no longer out of the question? Not necessary. The hope just a wee bit bigger. I had cheesiest cheek-to-cheek smile as the doctor leave the exam room, look at my husband in the eye and said, I’m SO going to do this race. Thank you for many-many prayer regarding to this. 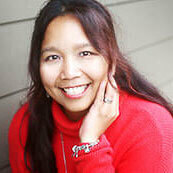 With the grace of God, a little miracle, my diagnosis changed. And hopefully, I can have this ankle heal in time and actually do AND finish the race. Keep that prayer coming! The next day – I saw my Physical Therapist. She worked on my ankle right away, did her thing to the muscle around it and gave me tons of homework. Because of the injury, I have to retrain my nerve around it. My balance is out of whack and it’s very important that I did a lot of balance routines. And strength training. I can’t run until the race day, but got an okay to do different cardiovascular activity like elliptical or stationary bike. My hope just get bigger. Today is Sunday, exactly 7 days before my race. I’m optimistic. I spent yesterday and today worked on my balance routines (four times a day) and strength training. I did even a four set of lunges today (Jes – that’s for you!). Tomorrow, I have a date with my personal trainer for an hour of torture strength training session, designed just for me. I had SO much help, and I’m so grateful for that. Today is the first day of 2012. I’m kicking it right. Here’s to another year of full with happiness and healthy days. For my people, you know who you are. I love you. Thank you for being such an awesome bunch.